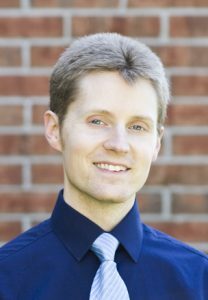 Brandon McDaniel is a new faculty member in the Department of Family and Consumer Sciences. He is teaching courses related to parenting and child development. As you can tell, McDaniel is a family man. He is a husband and a loving father of three children ages 7, 4, and 18 months old. “I usually spend any free time that I have with my family, and we all love running around like crazy in our basement and laughing, learning to ride bikes, going on walks, going to the Children’s Museum, zoo, and library, playing the Wii, and attending sporting events when there is time,” McDaniel said. McDaniel has a bachelor’s degree in psychology with a minor in family life from Brigham Young University, where he used to march snare in the drumline. He has his master’s degree and Ph.D. in human development and family studies from Pennsylvania State University. His research tends to focus on influences on, the development of, and outcomes of couple and co-parenting relationships, especially at the daily level—in order to capture life as it is really lived and experienced by individuals, families, and children. His other research interests include, media/technology in family life, transition to parenthood, and daily diary designs. When asked what he was looking forward to the most about teaching at ISU, McDaniel said, “I love getting to interact with students through teaching and research, and now I get to do this on a daily basis!” We are pleased to welcome such an enthusiastic, new faculty member to the Family and Consumer Sciences Department and wish him the best of luck with his new career!